Heatmapping is a simple and efficient way to analyze visitor interaction and user behavior on your website. If you are in a Conversion Rate Optimization (aka. CRO) project with your e-commerce or startup (or any other online) business, it’s indispensable to run some website heatmaps – such as click, mouse movement or scroll heatmaps. 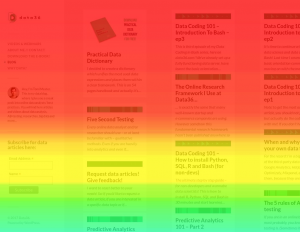 What is a website heatmap? If the above picture didn’t make it clear: a heatmap is created by recording all the clicks and mouse movements of your website visitors – then color the different parts by frequency. Red is the “hottest” (most frequented) and on the other end of the scale blue is the coolest (least frequented) part. This nice and easy-to-interpret visualisation format helps you to understand, which part of your page drew the biggest visitor attention. As you can see Hotjar has more features – so my recommendation is to go with that in most of the cases – and only when you know that you need advanced segmentation, go with Crazyegg. I don’t really like the rest of the vendors. I’ve tried Mouseflow, I didn’t find it user friendly, and the data they returned looked sometimes a bit off, so I just couldn’t trust it. When it comes to Clicktale, it’s pricing seems unreasonably high. And the built-in heatmap feature in Google Analytics, well… it’s not even a heatmap, so don’t use that either. (Just for the record: I love Google Analytics for the rest of the features it provides. Plus I have a hack in GA to get more accurate click maps for free – see in another article later). But wait… what is a heatmap on my website good for at all? It really depends on what kind of heatmap we are talking about. This is the most clear one. Eg. you have a landing page with four CTA buttons – of course you want to know, which one brings the most conversions. A Click Heatmap can easily show you, which one was clicked the most. Researches have already proved, that there is an ~80-90% correlation between eye- and mouse movements. I’m not not trying to suggest here, that eye tracking is not an important research to do. But for small businesses running some mouse movement heatmaps on 2.000 visitors for $29 might be better value for money, than running eye tracking researches on 5 users for $500-$5000 – if it brings roughly the same results. When exactly should you use it? Eg. on e-commerce product pages, where people spend big time with reading descriptions and watching product pictures, but they do not necessarily click. Based on where they move their cursor we can conclude what part of the page they were watching and get a good estimation of which part of the text they have read and which part they haven’t. You would be surprised, if you knew how many people are not scrolling. I have analysed over 1000 different pages in the last few years and barely have seen one, where more than 60% of people has scrolled below the fold. Who knows, maybe that’s not the case on your website – but it’s really easy to find out with a scroll depth heatmap. Note: and here I’d suggest to take a further look at the differences between mobile, desktop and tablet, because on mobile and tablet usually people are scrolling. How to implement your heatmap tool? 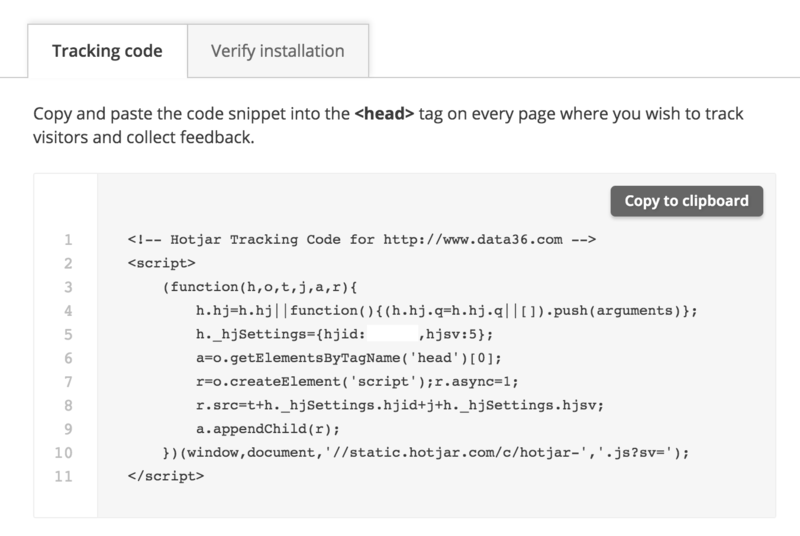 Note: If you are using WordPress, you can even use the free Hotjar and Crazyegg plugins. Before anything else, I like to run a few usability tests, where I can meet with the potential users and website visitors in real life and where I can see their interactions with my own eyes – even more I can ask questions from them. This helps me to point my attention to some key problems – that I might never think about by myself – and to some key elements, that I should focus on more during my researches. As a second step I like to go to Google Analytics and check the BEHAVIOUR —» PAGES and the BEHAVIOUR —» LANDING PAGES reports. With these two I can find the pages with high traffic – and probably bigger impact on my conversion results. It’s also important to see that heatmapping is not a “l’art pour l’art“ activity – once you are done with it, make sure that you are syncing the results of it with the other researches of yours (eg. five second testing, funnel analytics, cohort analysis, etc…) and these efforts all together are serving a purpose, which is usually optimizing your website content (or layout) via A/B testing. How to set up a website heatmap? When you click “+ New Heatmap”, you will have to give a name to your project. The next step is to specify the URL. It can be a simple match (eg. www.data36.com/website-heatmap-tools-features-best-practices), but if you are an advanced player, you can use regular expressions too (eg. for monitoring multiple product pages in an e-commerce store). If everything’s OK and ready to go: just start collecting data! That’s it! Let’s check the results one week later! You will get back three types of heatmaps automatically: a click, a scroll and a mouse movement heatmap – all segmented by device type (desktop, mobile, tablet). Note: I usually recommend to record 100 sessions only – sometimes 2.000… but I can assure you, that you won’t watch 2000 videos after all ;-). So how to profit from your heatmap data? If you see, less than 30% of people are scrolling… then try to move your most important content and USPs above the fold. You can test out your above the fold content with five second testing too. 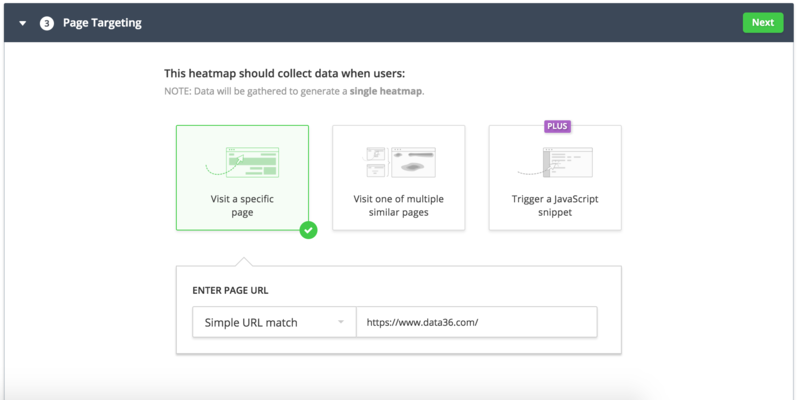 Form analytics: An easy way to understand your conversion funnels on your (eg. registration) forms is to do it by counting the actual clicks on the different fields. Heatmaps can do the job here as well. As I’ve mentioned, I’m generalizing with the above four examples. The aim was to give you some ideas on how to profit from heatmapping projects – but don’t use these without context… And anyway I highly recommend to A/B test every major changes on your website to make sure, that you actually increase your conversion rate. That’s all folks! Heatmapping is super-easy, super-useful and super-cost-effective for small and medium online businesses, so don’t hesitate to use it in your CRO projects! Choosing any of the tools I’ve listed, you can start within 5 minutes. When you are using heatmaps, make sure, it’s an essential part of your user research strategy: do pre-studies (eg. usability tests, and Google Analytics reports) and understand that this all happens to prepare better and more likely successful A/B tests! If you have questions, feel free to ask in the comment section below – otherwise don’t forget to subscribe to my weekly Newsletter to be notified about my upcoming articles, video tutorials, webinars, etc.